Last week I wrote about how I signed up for three "distributed computing" projects, including one that tests climate change prediction models. I thought I would check in to see what my computer has been doing in its spare time to help save the world. The screen shot above shows what my climate model was doing tonight. 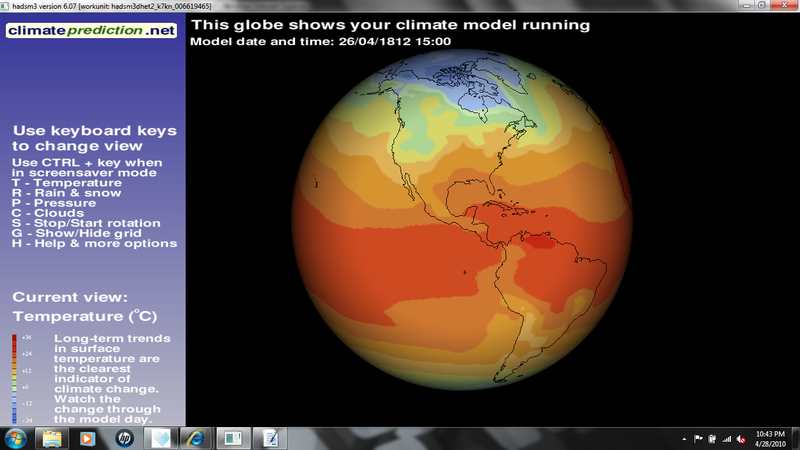 It is showing what the model would have predicted worldwide temperatures to be at 3:00 PM GMT (10 AM EST) on April 26, 1812. It shows about 12 degrees C (55 degrees F) where I am in New Jersey. That's right about what the temperature has been this week in NJ, 198 years to the week after the date of this model. So far so good. The idea of this distributed computing project is to run hundreds of thousands of climate simulations using slightly different values for the many variables involved. The simulations begin in 1810 and go to 2050. The simulation shown above took 9 hours to go through 2 years (1810 to 1812). Those climate models that can accurately model the past get the Citizen Scientist Seal of Approval for use in predicting the future. For a more in-depth discussion of this project, or to sign up your computer, you can visit ClimatePrediction.net. This site gave me chilling flashbacks to a computer modeling project I worked on for my undergraduate degree in mechanical engineering. All we were asked to model was a magnetic stirrer, the kind used in laboratories to stir beakers of liquid. The magnet inside the stirrer spins at a uniform rotational velocity around a fixed axis, but the magnet inside the beaker does not. The magnet in the beaker is slowed by the drag of the liquid, and its axis moves with the tangential forces. Your grade depended on how many of the possible variables your model considered. We spent many hours in the basement of the Computer Center (this was before PCs) trying to model a process that I'm sure is much simpler than the global climate. We were using Fortran, which I was surprised to find out is not only still in use, but is the preferred programming language for computational modeling. I am very glad to be able to lend my spare computing power to solving some very tough problems. Just don't ask me to write the code. Thanks for the information and search for magnetic stirrer hot plate. Very Nice blog. Your details on plant growth chambers is very informative. plant growth chamber now available for stability testing, environmental simulation, high value storage, bio safety level containment, high value storage and other special applications.